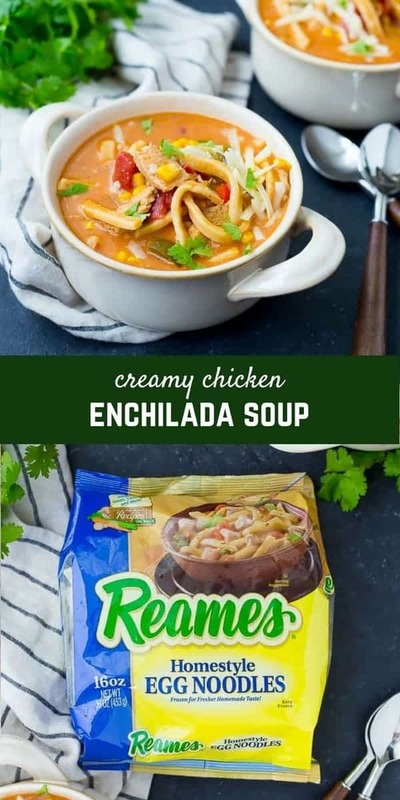 This Creamy Chicken Enchilada Soup with Reames Frozen Egg Noodles (I’m partnering with them to bring you this recipe!) is cozy, comforting and easy to make. You’ll love the twist on classic enchiladas with thick, hearty noodles swimming in a delicious broth. Has it been absolutely frigid where you all live? We’ve been trying to still get the kids outside here and there to play in the snow, but after coming back inside, we’re all craving something warm and cozy. Sometimes it’s a cup of hot cocoa but soup has been making an appearance on our dinner table more and more often. It warms you from the inside out, it’s hearty and filling, and most of the time it only requires one pan to make. All things I love! 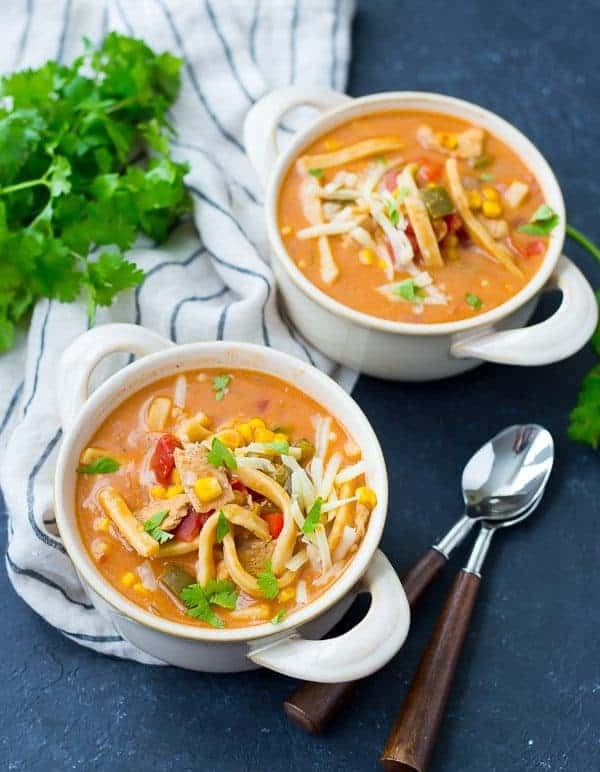 This Creamy Chicken Enchilada Soup with Noodles is a fun mash-up of chicken noodle soup and chicken enchiladas. It gives you all the flavor of chicken enchiladas – Mexican spices, tender chicken, peppers and onions. I added corn for a nice touch of crisp crunch and made it all nice and creamy, because what are enchiladas without cheese? 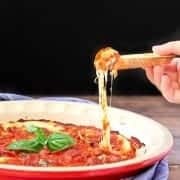 You can even add a sprinkle of cheese on top if you want it to be extra cheesy! Tip: Like beef more than chicken? 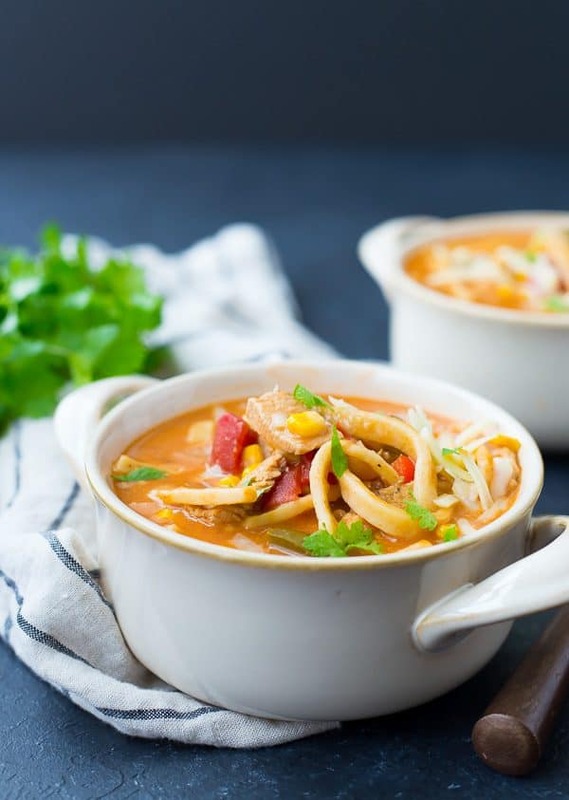 Try this with thinly sliced beef or even ground beef for delicious beef enchilada soup! Then I added the NOODLES. Everything is better with pasta, am I right? 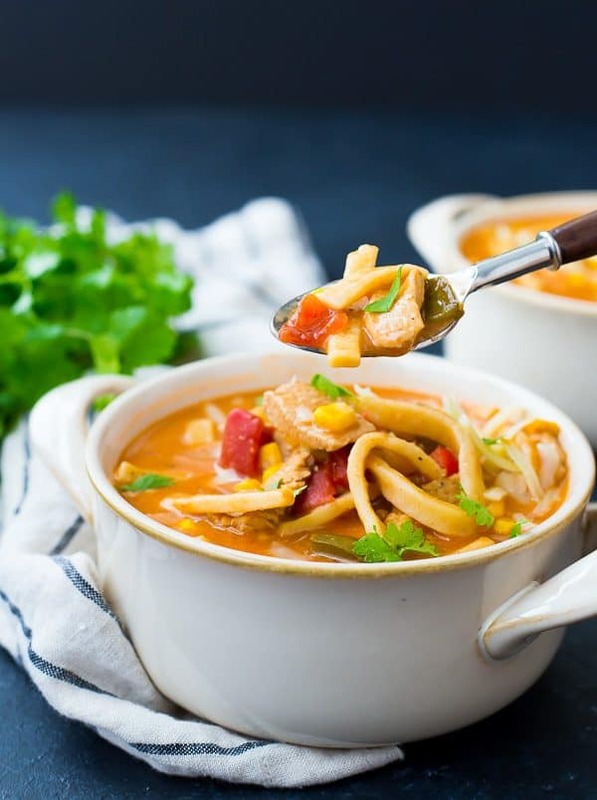 I teamed up with Reames Frozen Egg Noodles to fill this soup with thick, homestyle egg noodles. There’s something about these noodles that is so much more satisfying and cozy than dried pasta. It’s probably because they taste like homemade pasta so you feel like you’re in grandma’s kitchen eating a hot bowl of soup. Another thing I personally love about Reames Frozen Egg Noodles is that all of their Frozen Egg Noodles are made with 3 simple ingredients: Eggs, Flour, Water. Reames Frozen Egg Noodles take a little longer to cook than dried pasta, but it’s worth it. 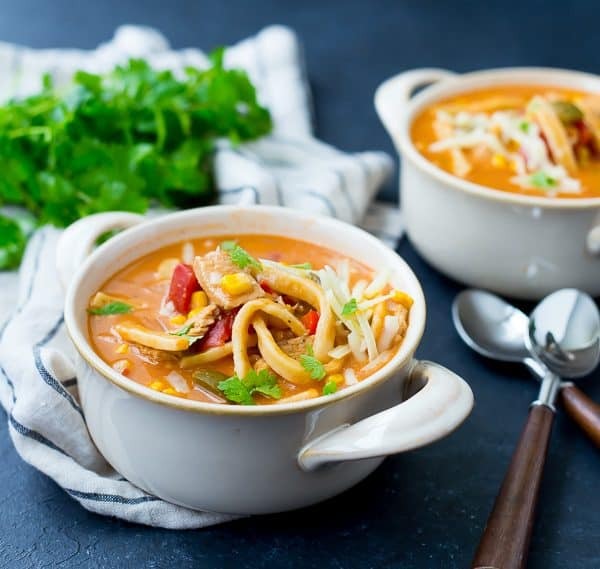 It helps all the flavors in the soup meld and the result is undeniably irresistible. All in all, it’s ready in about 45 minutes and it’s just the cozy and comforting thing you need after a chilly day, whether you spend it inside or outside. 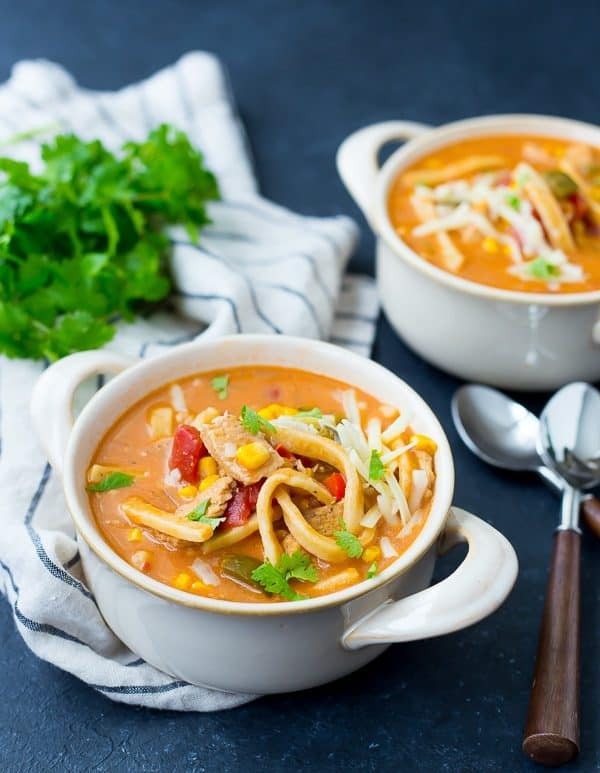 This Creamy Chicken Enchilada Soup with Noodles is cozy, comforting and easy to make. You’ll love the twist on classic enchiladas with thick, hearty noodles swimming in a delicious broth. In a large pot, heat oil over medium-high heat. Add chicken, onion, and bell peppers. Sprinkle with salt and pepper. Saute until onions are translucent and chicken is browned (5-6 minutes). Add spices (chili powder, cumin, oregano) and stir to toast slightly, about 1 minute. Add tomato paste and stir until all ingredients are coated, being careful not to burn. Add tomatoes, chicken broth, and water and increase heat to high to bring to a boil. 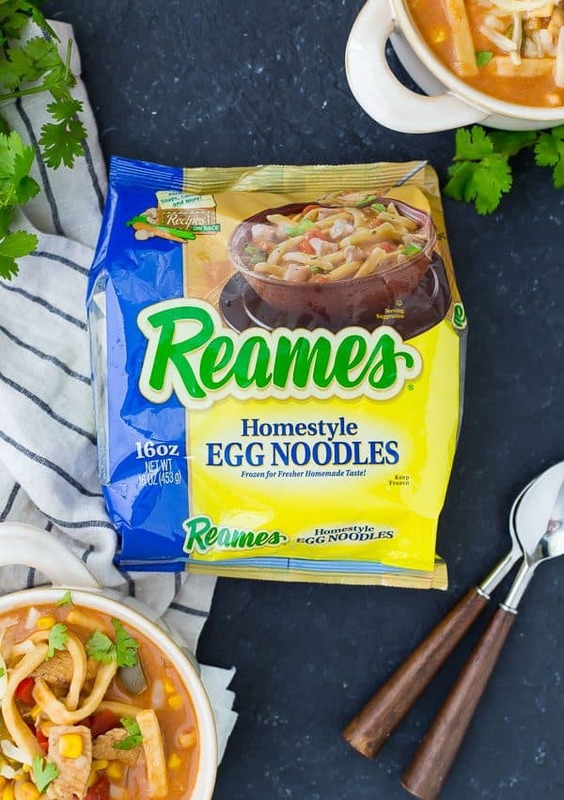 Add Reames Homestyle Egg Noodles, return to a boil, and cook uncovered for 20 minutes or until noodles are tender. Reduce heat to medium-low and stir in corn. In a small bowl (or measuring cup), whisk milk and cornstarch until no lumps remain. While stirring, pour into soup and continue to heat for about 5 minutes or until slightly thickened. Stir in cheese and cook until melted. Serve immediately topped with fresh cilantro and additional cheese if desired. Verdict: I looooved this soup. The thick chewy noodles kept me coming back for more. 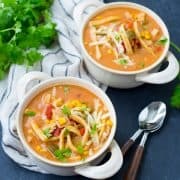 Husband’s take: Ben loves this soup too – he had most of the leftovers and said he’d want to add it to the regular rotation! If you need help finding the product, use their product locator! Soup is always special for me. Thanks for giving me some healthy soup ideas. And I like more the chicken soups. This one is my favorite. Thanks for sharing! 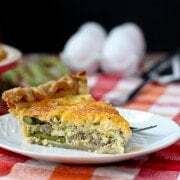 I’m so happy to hear you love this recipe! Thanks for taking the time to come back and leave a comment! I love tuna noodle casserole with egg noodles, the home style ones sound wonderful. I have to give it to Beef Tips and Noodles! They are so good! My dad’s gumbo with homemade andouille sausage always takes me back to my childhood. Lasagna always brings me home. My grandma used to make chicken dumpling soup with dill and lots of peas. That recipe always takes me back! chicken and dumplings brings me home since i helped make it with my dad and we always used a duck cookie cutter to make the dumplings shaped. Sounds so yummy – in fact I am going to double the recipe (1) because it sounds so yummy!! and (2) because I want to use the whole package of noodles!! Do you think that would be okay?? You’ll need a big pot, but it will definitely work – I think it’s a great idea! You’re the best!! I always take your treats to the missionaries in our ward (as I will a container of this — and some for us!!) and they love your ‘stuff’!! Thank you!! Sorry bout all the ?? ?s but I was thinking of having Hubby make this tonight and he needs exact directions…thanks ! Sorry again! I emailed you as well to make sure you got the answers you need and can enjoy this soup tonight! Why do I need an entire cup of cheese for garnish? When do you add the corn and milk? The cornstarch is used when…??? I’m so glad you commented! It looks like I missed a step when I copy and pasted from my recipe document, I’m so sorry about that! I updated the recipe and that should clarify the corn, cornstarch/milk, and cheese. My apologies!